The Ashan Compendium is the illustrative guide to Ashan, the current fantasy world setting of Might and Magic. The book covers the magical beginnings of Might and Magic with the three major periods, the Mythic Age, Ancient Age and Historical Age. It includes an extensive timeline that goes up to 989 YSD, the end of the Sixth Eclipse. Then you have a section on the dragon gods. After that there are the nine factions together with information on their history, culture, abilities and warriors. It's a good read that provides background to their intricate diplomatic relationships. The artworks are amazing. They remind me of those illustrations you see from Magic the Gathering cards. I love the character designs here. You can really feel the magic, especially for those more spiritual characters, such as the Djinn from the Wizards, or anything with glowing hair. I also like reptilian humanoids, the half-human-half-snake warriors, from The Lotus Empire. Those are awesome. There are many more and the illustrations are printed quite big. Nice. Most are character art. There aren't any environment art. 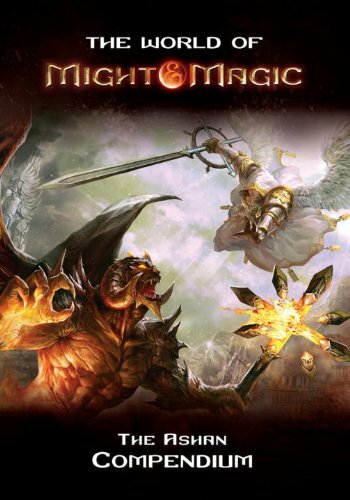 It's a great book for fans of Might and Magic. Even if you're not a fan of the game but like the art, I'll recommend it too. It has beautiful art.